Manny Pacquiao, the Filipino boxer, indicated that he was perplexed by upcoming opponent Timothy Bradley’s pre-fight ritual for avoiding taking a shower for a week. Pacquiao, 35, told Philippines-based broadcaster ABS-CBN thought it was unhygienic to not shower before a match. He said one should shower after every training session. Bradley told ABS-CBN recently that he has always not taken a shower during the week leading up to a fight. “I don’t know why… that’s one thing I don’t do. The week, Monday, Tuesday, Wednesday, Thursday, Friday, I don’t take a shower. Saturday, that’s when I take a shower for the first time,” he said. The two boxers will fight for a second time on April 12. In their first fight, Bradley won via decision, but many viewed it as controversial. 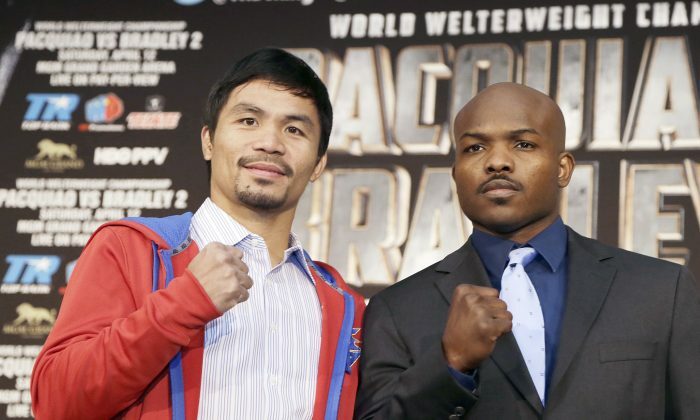 Pacquiao is slated to earn approximately $20 million for the bout, while Bradley is looking to get $7 million. After the two face each other, longtime Pacquiao opponent Juan Manuel Marquez said he wouldn’t mind fighting Pacquiao for a fifth time or Bradley if he wins. The Los Angeles Times reported that Marquez had a change of heart. “He wants the challenge of the Bradley – Pacquiao winner, he wants to make history of a fifth world title in five divisions. If Pacquiao wins he’ll have the belt and, Juan wants it,” Fernando Beltran, his promoter, told the Times. The reports come as singer Ashanti is slated to sing the American national anthem during the HBO Pay Per View of the Bradley and Pacquiao fight on April 12 at the MGM Grand in Las Vegas. Pacquiao said he’s a fan of Ashanti, according to Ring TV. “I told her I was a big fan and asked her if she would sing the U.S. National Anthem at my fight against Timothy Bradley. She quickly checked her schedule, and then said she could and she would. The Knicks may have lost that night, but I felt like the biggest winner in the world when I walked out of Madison Square Garden,” he said. Meanwhile, Ashanti said she would be rooting for Pacquiao. “I’m such a huge fan of Manny Pacquiao. I have family in the boxing business — Howard Davis, Jr. and Dyah Davis. When I found out we were sitting next to each other courtside at the Knicks game, I said to my Dad, ‘We should take a picture,” said Ashanti.